For a relaxing, luxury retreat, head to five-bedroomed Villa Baris on Turkey's stunning Turquoise Coast: a cosmopolitan. 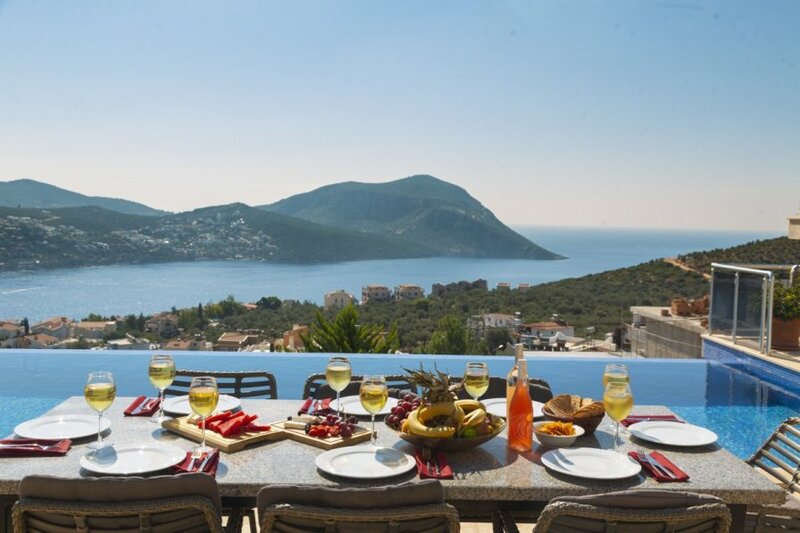 For a relaxing, luxury retreat, head to five-bedroomed Villa Baris on Turkey's stunning Turquoise Coast: a cosmopolitan, vibrant resort perfect for exploring the timeless beauty of ancient Lycia's pine-clad shores. The villa is in a peaceful spot, set against a breath-taking mountain backdrop, and boasts panoramic views of the sea from your private pool and beautiful outdoor sun terrace. Outside, there's an elegant infinity pool with a cooling Jacuzzi corner – perfect for enjoying the balmy days and evenings. You can while away the afternoon one of the comfortable sun loungers or choose a shady spot to curl up with a good book while enjoying the serene vistas. With an alfresco dining table, and a meze and baklava delivery service too, you'll be forgiven for never wanting to leave. The bedrooms are set over three floors and are all equally seductive, stylish and serene. There's a double bedroom with an en-suite and private balcony, a double bedroom with an en-suite and Jacuzzi bath and a twin bedroom with an en-suite that share a sea-facing balcony. On the second floor, you can choose from the double and twin rooms both with an en-suite and large balcony. - Double bedroom: en-suite shower room, private balcony. - Double bedroom, en-suite bathroom room with jacuzzi bath, shared balcony. - Twin bedroom, en-suite shower room room with jacuzzi bath, shared balcony. For outdoor exploring, there's many a trail with notable sites. The best known, and arguably most scenic, is the Lycian Way – a 310-mile tying-together of goat tracks and timeless paths, which traverses deserted beaches, lush forests and soaring peaks, and stops at the ghost village of Kayakoy near Fethiye, with charming abandoned Greek buildings. With the majestic pine tree-lined Taurus Mountains as a backdrop too, families can explore the deeply cut canyons.